January | 2018 | What Next? 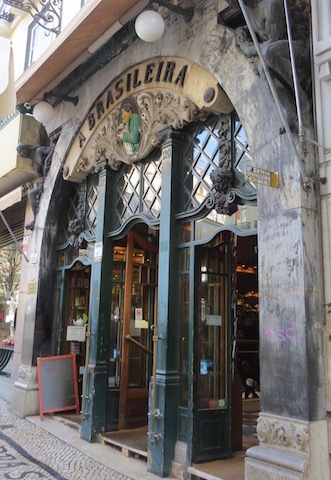 Our second night in Lisbon a waitress in a fur coat standing at the door of her establishment lured my husband inside. We had been walking in a giant circle for quite some time, with Dave trying to pick the perfect restaurant and so he was feeling pressure to make a choice. I think he might have been a little relieved that the decision was out of his hands when the woman almost pushed us through the front door, and seated us at a table. A singer and two instrumentalists were performing. 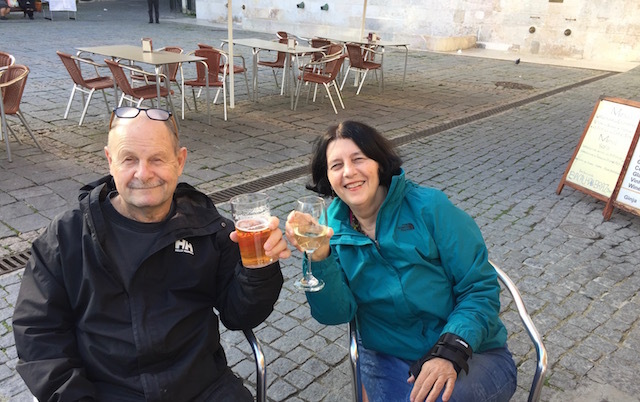 “This is fado,” our waitress whispered. 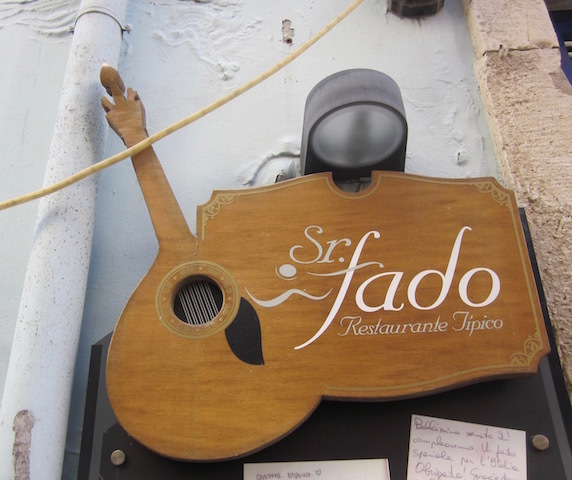 I wasn’t sure what fado was, but the singer looked like he was almost in pain, his eyes closed. 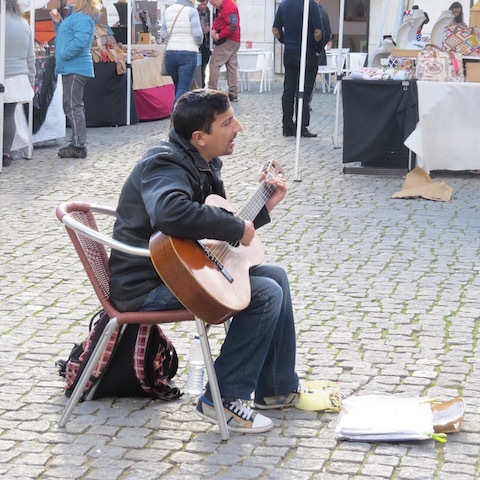 Although we didn’t understand the Portuguese lyrics it was obvious whatever he was singing about was of a dramatic and sad nature. 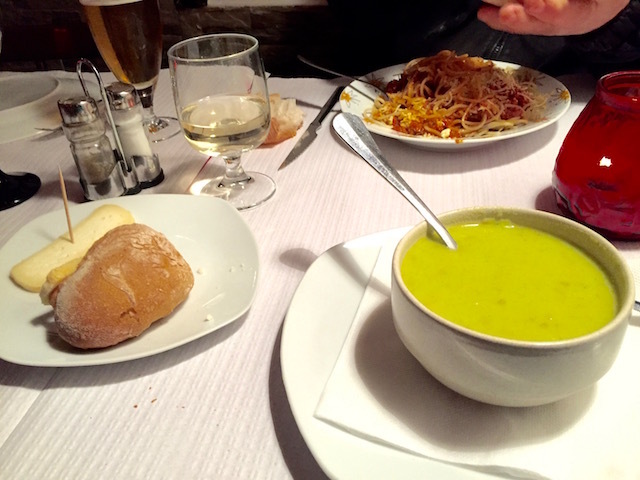 The prices on the menu were a little dramatic too, so we opted for bread and cheese, and a bowl of vegetable soup and another of spaghetti, which we shared. 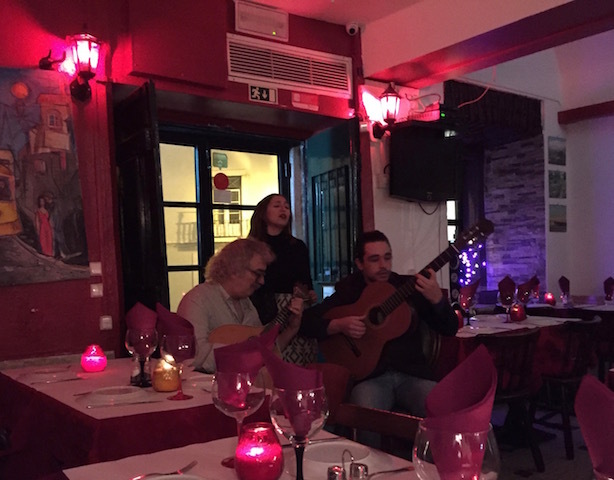 The food was excellent however and while we ate a young woman came up and did some more fado singing. Her performance was just as dramatic as her male counterpart’s. As we left the restaurant the waitress in the fur coat stopped to talk to us. She told us fado is a kind of music unique to Lisbon and directly translated means ‘fate.’ The songs are always melancholy in nature and singers are accompanied by different kinds of guitars . 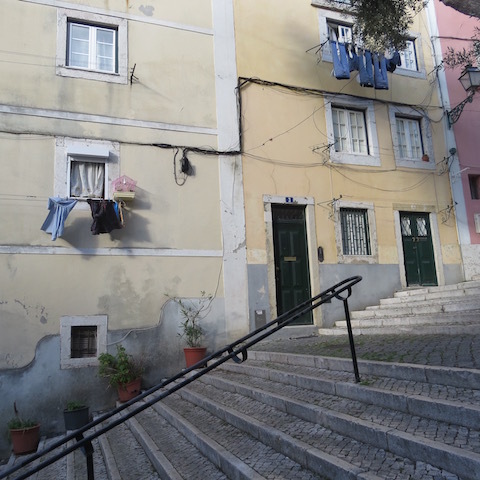 The origins of fado are difficult to trace with possible sources being Brazilian slaves, Portuguese sailors or the Moors. The waitress said she hoped we’d come back. I’m not sure we will. 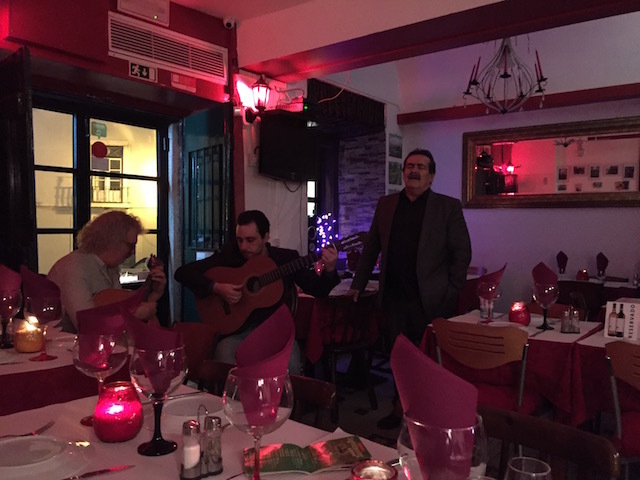 I was glad to have been introduced to fado but I’m thinking it won’t become a new music interest for me. A Little Pizza With Your Organ Music? After a while the Dutch pair had to leave to catch their plane home but by this time I had gotten into quite the conversation with the psychiatrist who had stopped off in Portugal on his way back to the United States from Berlin where he’d been working on a paper about the similarities between psychotic and religious experiences. 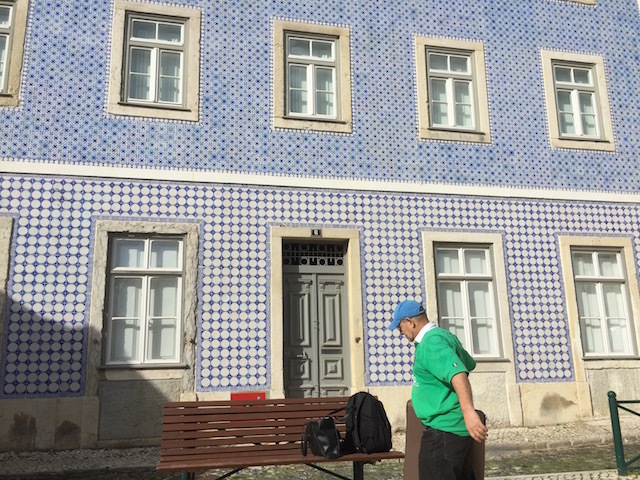 His side trip to Portugal was to help him get over the break up with his fiancee, a Luther scholar, which led me to tell him about the paper I wrote in college comparing Luther and Loyola and how students at that college shared their written opinions on a bulletin board called The Wittenberg Door. The psychiatrist had been to Wittenberg with his former fiancee, and for some reason he decided to pour out his heart to me and I heard a long story about his mother’s cancer diagnosis, his fiancee’s sudden change of heart about ever having kids which led to their breakup, his former romance with a professional musician who plays in a Central American symphony orchestra and his worries about getting older and now needing to find a new partner who would want to start a family with him. After the psychiatrist went on his way, the shop owner helped Dave pick out his port and Ginja liquer and told us about his family’s experience being expelled from Mozambique after the country declared its independence from Portugal. Most people lost everything as they fled the country. 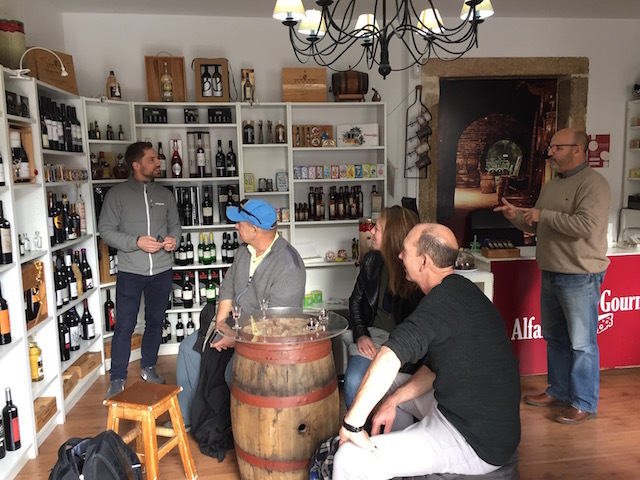 You never know who you will meet or what stories you will hear when you step into a little wine shop in Lisbon! 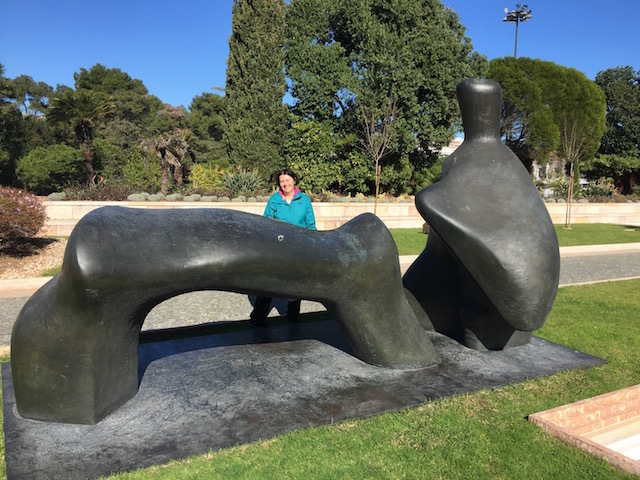 Sure enough when I showed my husband the didactic panel on the sculpture at Lisbon’s modern art gallery it was a Henry Moore and it was called Reclining Figure too. 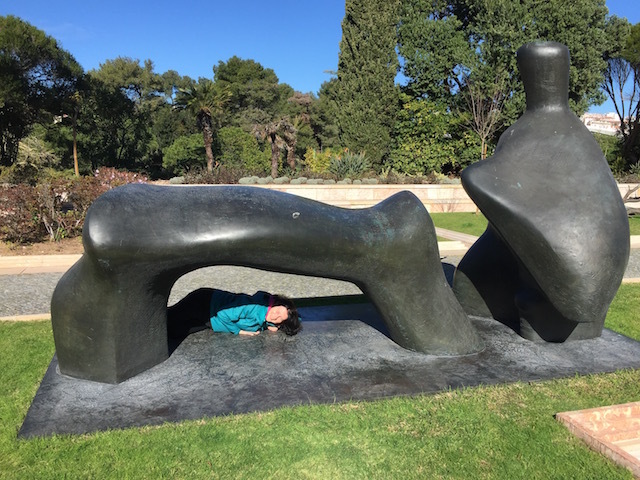 My husband insisted on taking photos of me with the Moore sculpture his way! 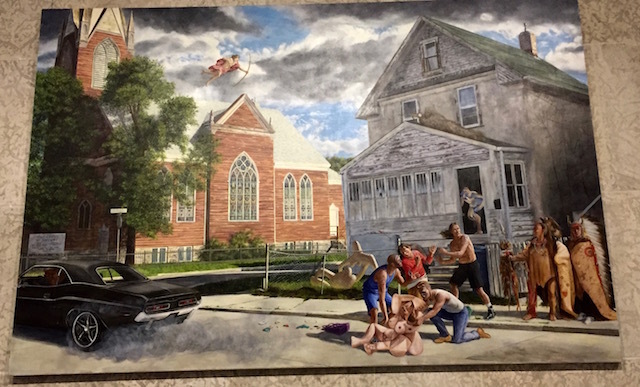 I told Dave there was a Kent Monkman painting currently on display as part of the Insurgence/Resurgence exhibit at the Winnipeg gallery that includes a reference to Henry Moore. 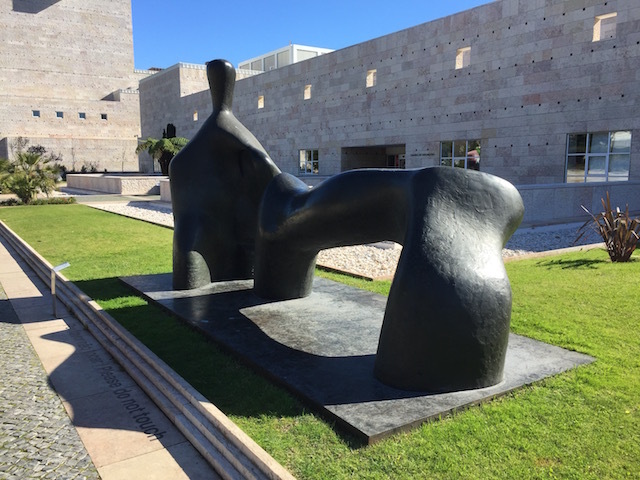 Inside the Lisbon art gallery I found another Henry Moore piece. 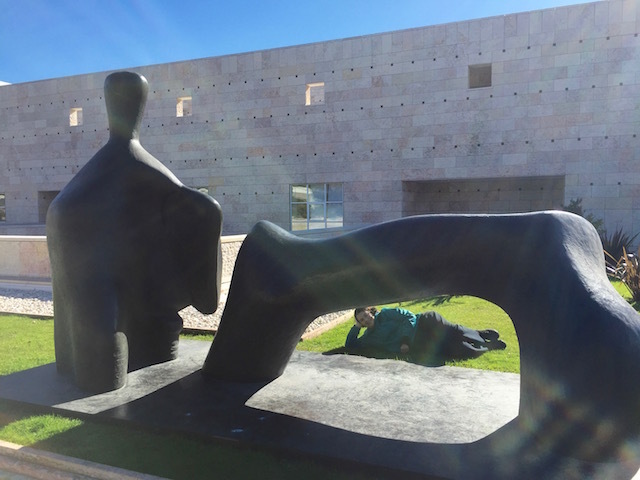 The Henry Moore connection was just one tantalizing tidbit of the absolutely wonderful afternoon we spent at Lisbon’s Museu Coleção Berardo. 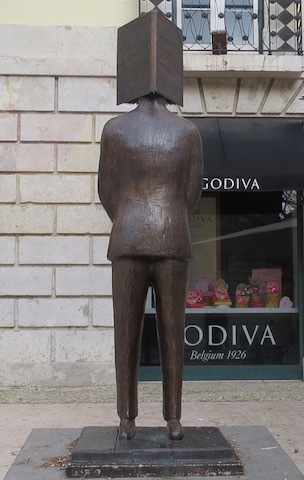 It holds such a rich cache of modern art and on weekends which is when we visited it was FREE! I’ll share more in future blog posts. Yuri, a former top three national surfer in Portugal, performs the ten minute speed version of Portuguese history. 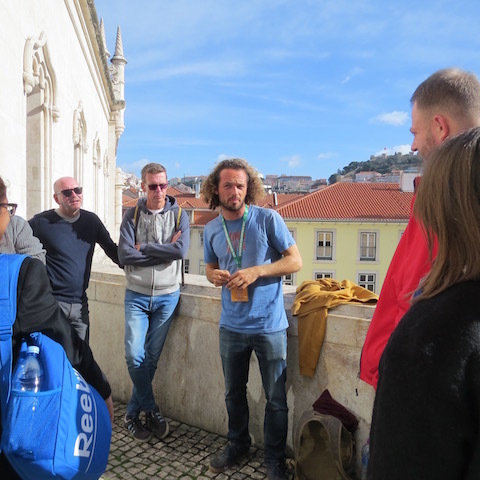 Cool people from all over the world visit Lisbon. 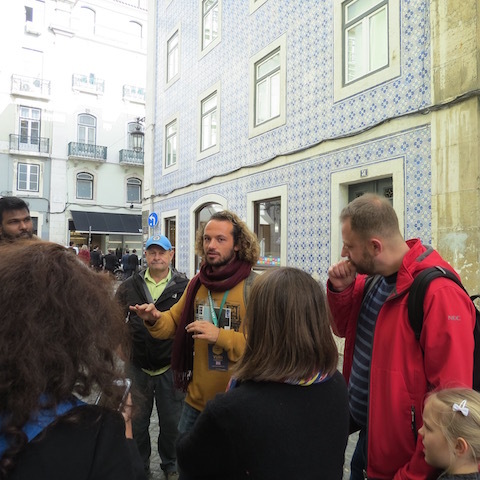 We went on a free walking tour of Lisbon with a curly haired fellow named Yuri a surfer/business student/music entrepreneur/tour guide who provided us with a ton of interesting information about the history and culture and geography of Portugal in a dramatic way. We were joined on the tour by parents from Poland and their two young children, partners our age from Brighton, England who were on their way home from a trip to Senegal, a recently married couple originally from India but living in Paris, and a single woman who was a petroleum engineer from Kulala Lampur, Malyasia. 2. 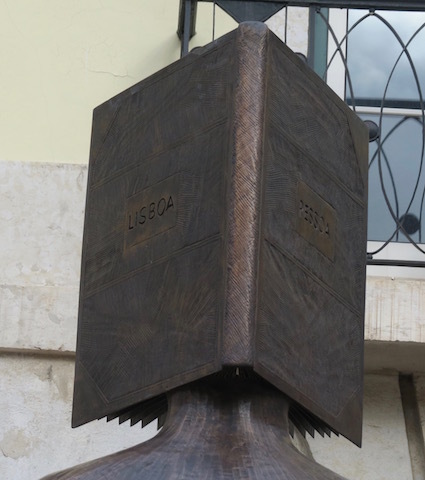 Lisbon’s most famous poet had multiple personalities. 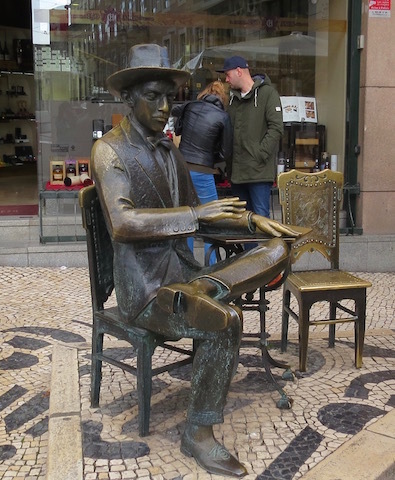 Fernando Pessoa(1888-1935) assumed many different personas and wrote poems under more than 80 names. Quote from a Pessoa poem..
3. 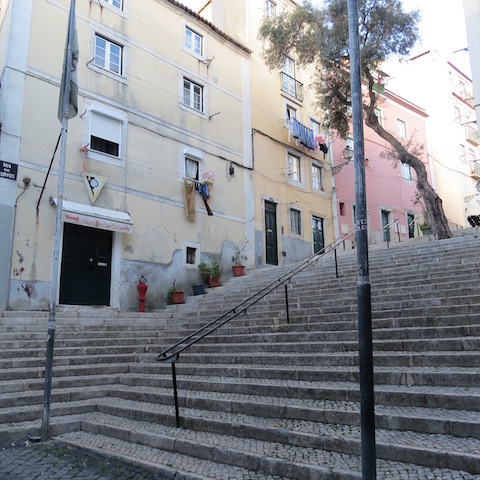 Lisbon has the oldest continously used book store in the world. The Bertrand Bookstore was opened in 1732 and has never closed. 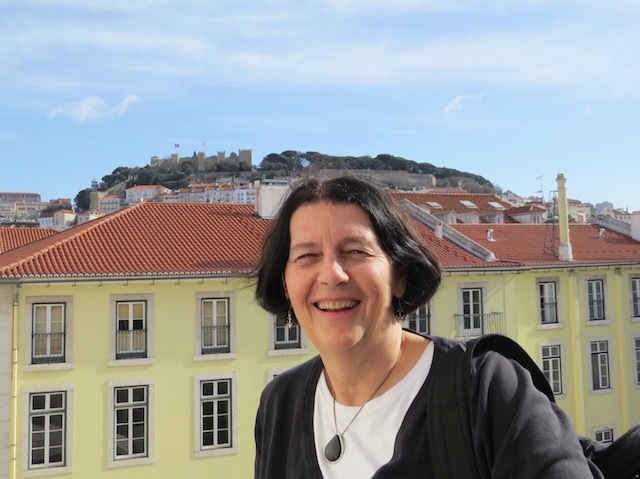 It has been a meeting point for Lisbon’s intellectuals and writers for centuries. 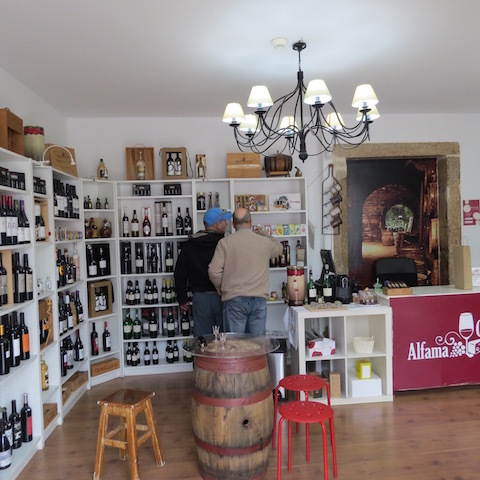 There are 53 branches of the store throughout Portugal. 4. There’s a fake castle in Lisbon. 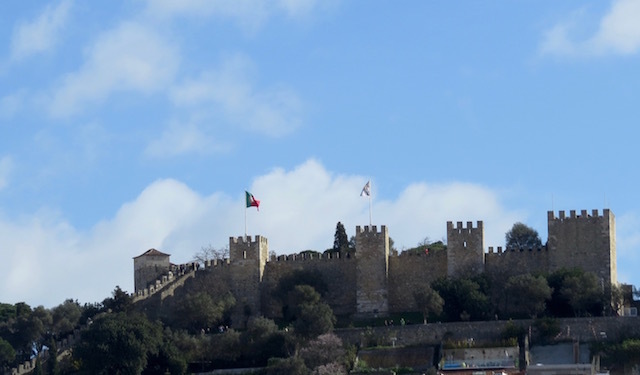 Our guide showed us Castelo de S. Jorge up on a hill. He said it was once a real castle but was destroyed in the great earthquake of 1775 and the walls have been reconstructed in modern times to attract tourists. But it’s just a facade. There is no actual castle inside the walls. Reviews online agree. Being up at the castle gives you a great view of the city but there’s nothing much inside it to see. 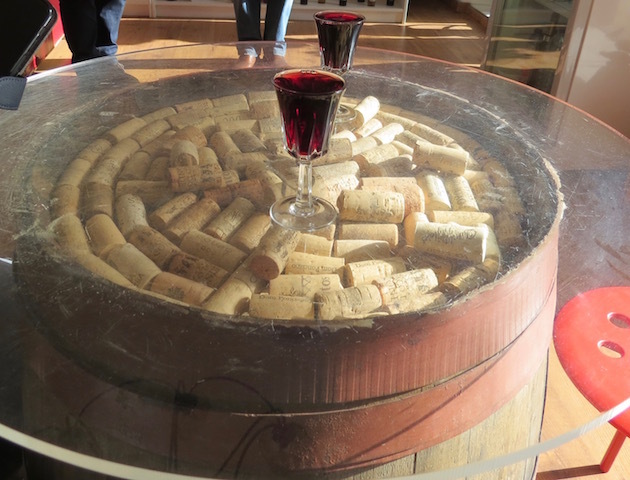 It costs 8 Euros to tour the castle. I’m happy with the view I got of the fake castle for free. 5. 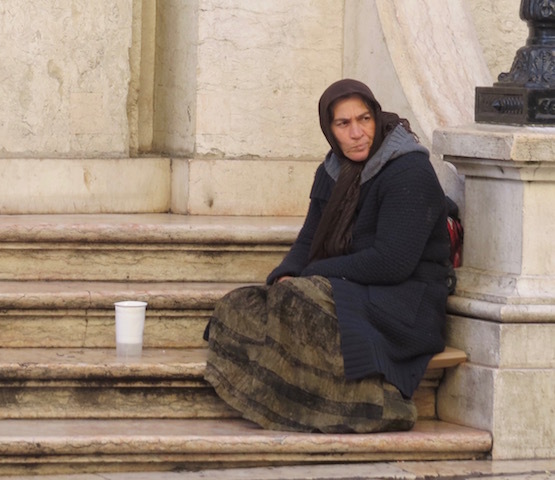 The women you see begging at all the cathedrals in Lisbon belong to the same extended family. According to our guide they are professional beggars. 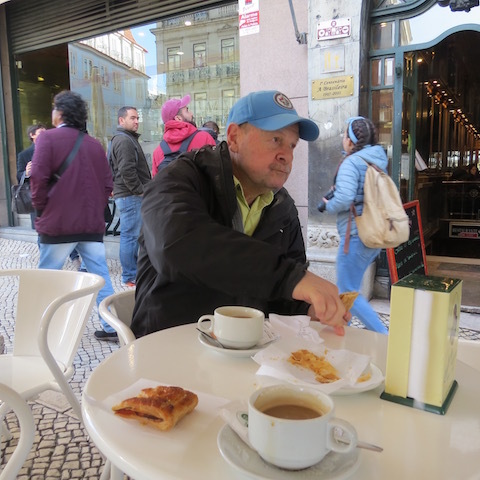 He said there is no need for begging in Lisbon because more than 50 different places offer folks free food. 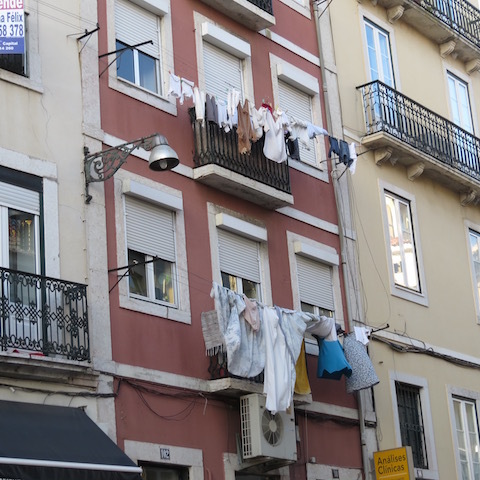 I am not sure if I believe him because a Portugal News story I read said there 2.5 million people in Portugal at risk of poverty, although the rate is going down. 6. 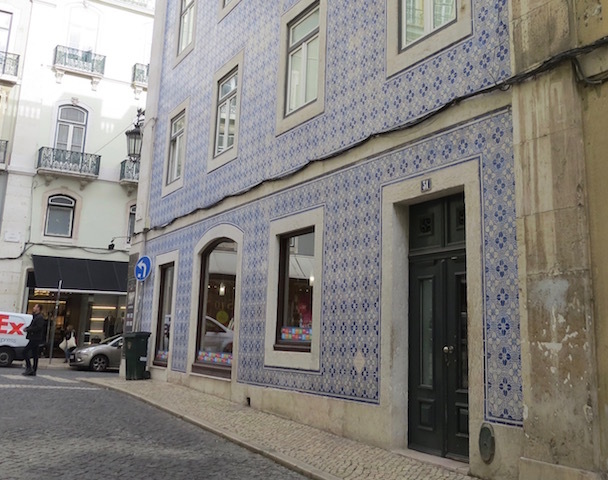 There are multiple reminders in Lisbon that Brazil was a colony of Portugal from 1500 to 1822. Exports of gold, coffee, sugar and cotton from Brazil were great contributors to the Portuguese economy. 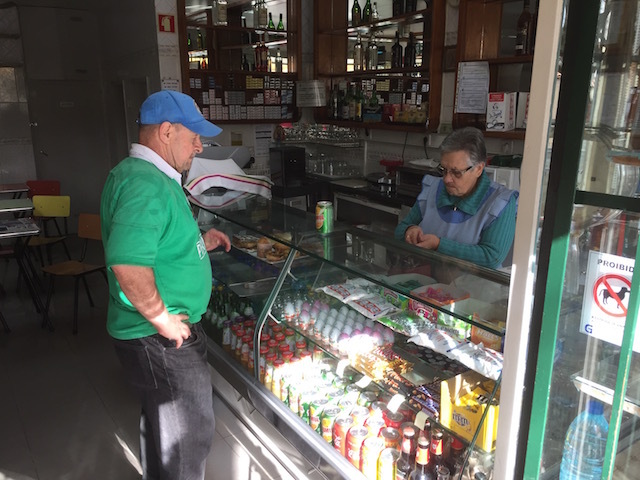 Coffee shops like the Brasileira near Largo Chaido where we had breakfast just before our tour provide lasting reminders of the Portugal- Brazil connection. 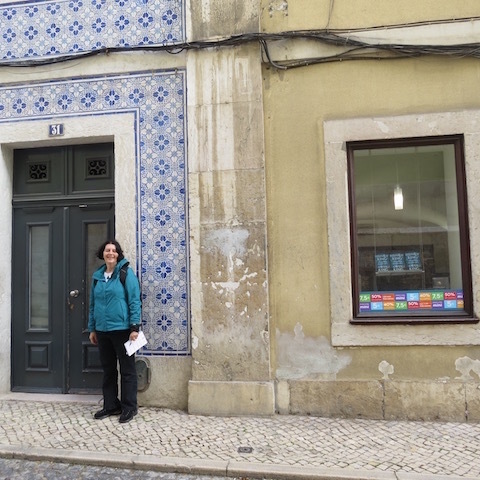 I am sure we will learn many more interesting things about Lisbon during our time here, but Yuri’s tour gave us a good start. 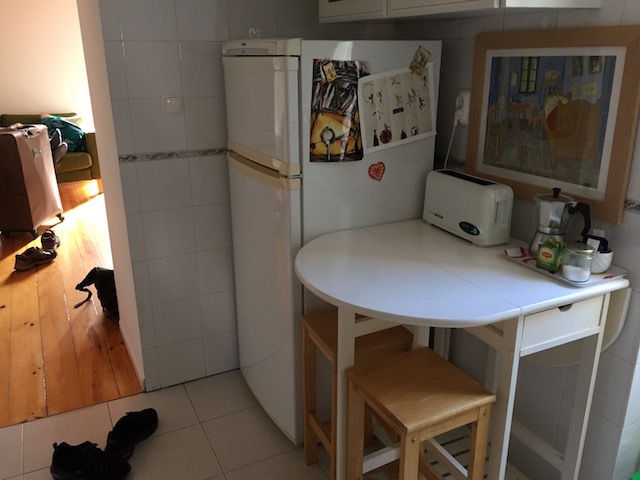 How should we get to our place? 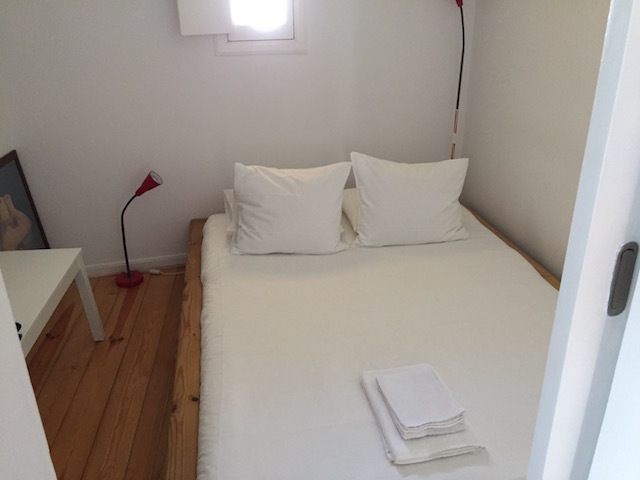 When we arrived in the Lisbon airport after being en route from Winnipeg for nearly 24 hours Dave asked me if I thought we should take a taxi or the metro subway to the little apartment we had rented in the Alfama area of the city. I suggested a taxi since we were tired and had hardly slept on the plane…. and I had a fractured wrist in a brace………. 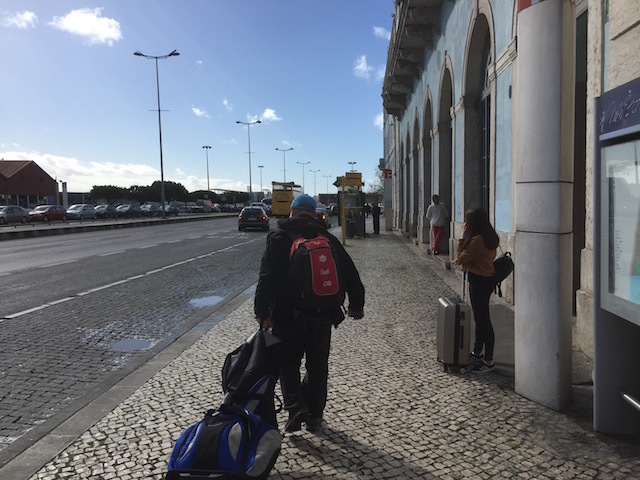 ……and Dave had a 40 pound golf bag in tow…. 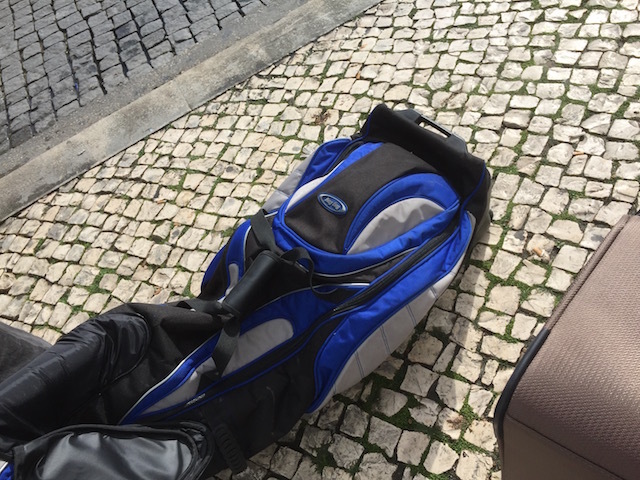 and I had a large suitcase filled with materials for writing and sketching projects….. and we each had a back pack. 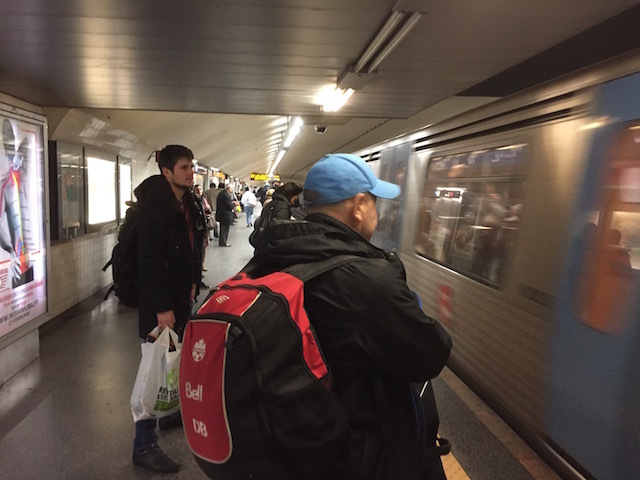 Dave decided it would be more of an adventure to take the subway. And was he ever right! We got lost in metro stations twice but a couple of extremely nice people including the young man in the photo above helped us out, steering us in the right direction and even carrying my suitcase for me. When we got off the train in our neighborhood we still had a long walk ahead of us to our apartment. Dave had downloaded a route for us in Google maps but it wasn’t very helpful. 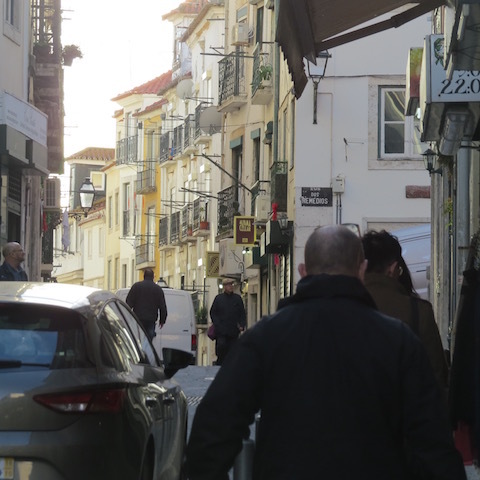 Many of the streets in the Alfama are VERY STEEP and covered in cobblestones. It was hard to push luggage up those stones slick from an afternoon shower and it wasn’t long before we were lost and Dave wasn’t at all sure where to go. I was plumb tuckered out. So when we got to this lovely little church and I saw a park bench beside it I told Dave I was going to sit down and just enjoy the sunny afternoon while he looked for our place. He could come back and get me once he had found it. Dave was gone a LONG time and I thought he might have forgotten me but he finally showed up. He had found our place and the actress who owns it and he would take me there. 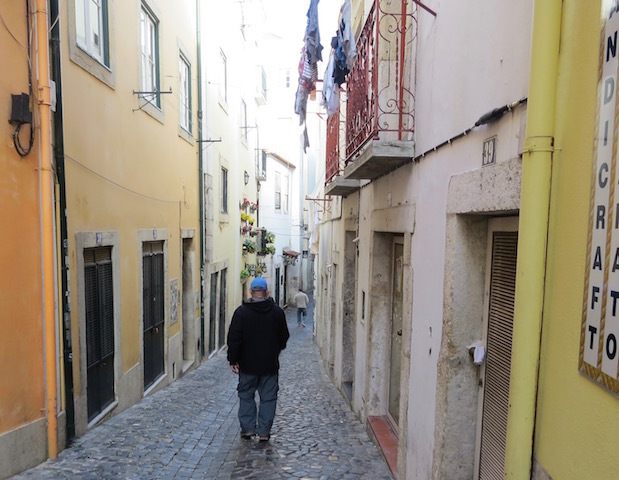 He carried my suitcase up the narrow steep streets but………… halfway there he was plumb tuckered out and had to stop for a drink. He told the woman in the shop, “I’m thirsty.” She thought he was saying ‘whiskey’ instead of ‘thirsty’ but he finally explained he wanted orange juice. Dave carried my bag up the three flights of outdoor stairs to our apartment and then up another four narrow flights of stairs inside since we were on the top floor.The actress had just finished cleaning our apartment and Dave asked her if she was in a play that evening we could attend. She just laughed and said she wasn’t. 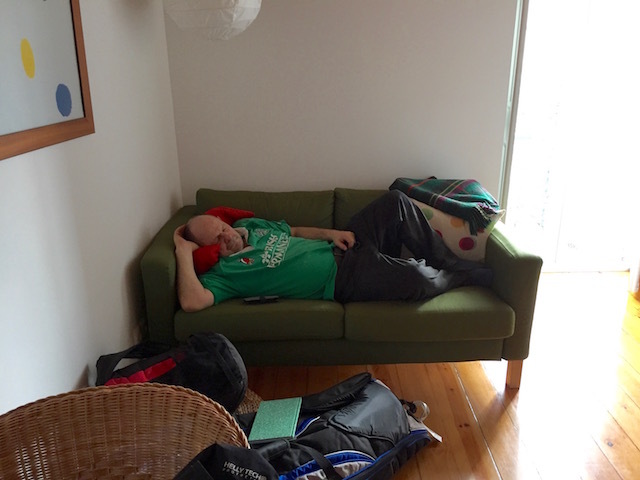 By the time we got into our cute little apartment, Dave was plumb tuckered out again and he needed to have a nap, so I explored our place while he slept. Dave woke up refreshed and we hit the streets of our cool neighbourhood. 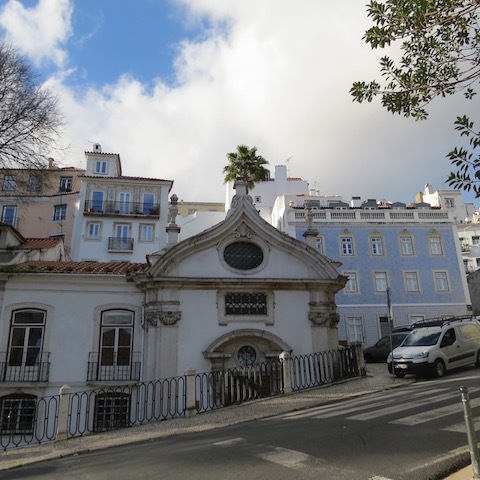 The Alfama got its name during the time the Moors occupied Portugal beginning in 1249. 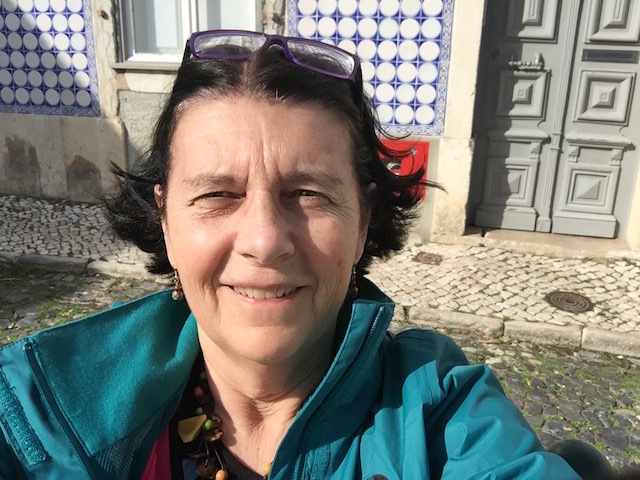 There was a huge earthquake here in 1755 and the Alfama was the only area in the city to escape unscathed so it is very old and the architecture is just lovely! We stopped to have a drink at a street side establishment and listened to a guitarist. 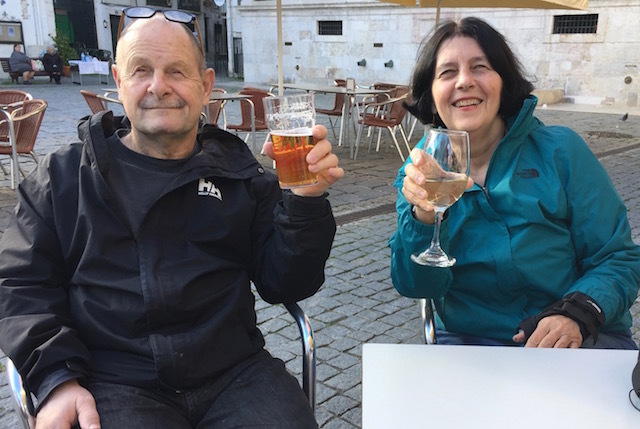 We were both feeling better and no longer plumb tuckered out so we drank a toast to our Portugal holiday. The story in The Things We Keep by Sally Hepworth reminded me of the novel Still Alice by Lisa Genova because it is also told in the voice of a person being effected by Alzheimer’s, although in this case it is not a fifty-something college professor but a thirty-eight year old motor cycle riding paramedic named Anna. 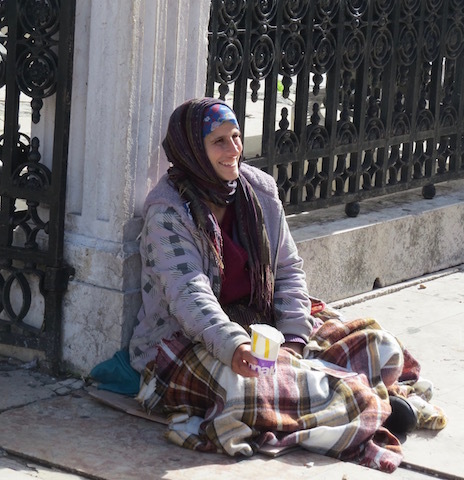 Anna’s brother arranges for her to live in a care facility after it is no longer safe for her to stay with him and his young family. Here Anna meets Luke a man about her age who is also suffering from dementia. They develop a romantic relationship that brings a momentary escape from their situation and adds meaning to both their lives. But their families and the staff at the care home aren’t sure how to handle their relationship. 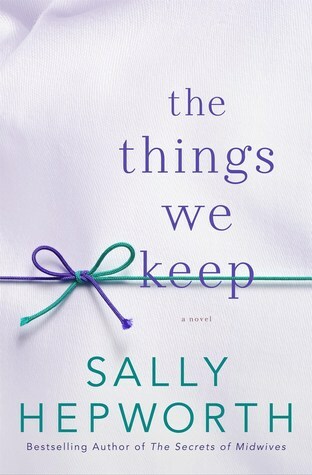 The Things We Keep has a second narrator, a young woman named Eve who is trying to start life over as a cook in the care facility where Anna and Luke live. Eve’s husband has died, leaving her and her young daughter Celementine destitute. The book made me think about how important it is to live in the moment, to enjoy and appreciate the here and now and to relish whatever love and happiness and meaning it brings. It also made me think about what life is like for people in institutionalized settings. There is a whole network of relationships to navigate and a power imbalance to be handled with responsibility. There are opportunities for caring and love but also hurt and harm. It made me think about the people I know who live in such settings and wonder how I might feel if I have to live in that kind of a facility someday.